Fed up with the same boring old cheese sandwich? Then it's about time you started putting something else between your slices of bread. Sandwiches have earned themselves a bit of a reputation as an essential but not necessarily exciting, solution to lunchtime food. However, with the huge variety of bread around these days and the endless variations for interesting sandwich fillings, there's really no excuse for a boring sarnie. This is a nutritious and tasty answer to lunchtime boredom. A freshly baked baguette will really add to the experience but don't worry if it hasn't come straight from the oven. Split the baguette then spread liberally with hummus. Sprinkle over a handful of freshly grated carrot. Split a ciabatta roll and place a few slices of mozzarella on one half. Top with some chopped sun-dried tomatoes then replace the other half of ciabatta and cook in a sandwich maker for a few minutes, until the cheese melts. 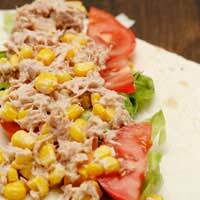 Spread some hummus over a tortilla wrap then evenly place some sweetcorn, kidney beans and chopped red pepper on top. Tuck in the end then roll up the wrap and slice in two. Butter two slices of wholemeal or granary bread. Mix a can of tuna with some mayonnaise and grate some cheddar cheese. Spread the tuna mix over one piece of bread and top with the cheese. Replace with the other piece of bread then cook in a sandwich maker for a few minutes until the cheese melts. If you don't have a sandwich maker, you can still enjoy this - just toast the bread and fill. This may sound a bit posh for a student lunch but cream cheese is fairly cheap and you can buy small packs of smoked salmon for less than you might think. Split the bagel (you can then toast it if you like). Spread a thick layer of cream cheese over one half then lay some smoked salmon on top. This is a good way to use up any leftover roast chicken. Slice a pitta bread in half then warm it through in the toaster. Open out each half to create pockets then spread some green pesto in each half. Add some chopped chicken and finely sliced iceberg lettuce. Hopefully that's given you some inspiration for lunchtime snacks. You just need a few key ingredients to create some really interesting sandwiches and it will work out a lot cheaper than eating in the college canteen every day.